If you have followed me on my blog since last November, you might have noticed I am a Game of Thrones fan. I was never all that into the fantasy genre before, but after I gave into the hype of the TV show phenomenon I was hooked on it. I didn’t have HBO, so I began watching the seasons on DVD from Netflix not long after the third season finished airing. I would eagerly await the two episode DVD in the mail about every four days. If I could have binge watched three seasons in a day, I totally would have. The series was good. It was damn good. I can’t say it any better than that! A show like Game of Thrones is rare. I don’t think it’s often a production team comes together with an epic author, chooses such perfect acting talent, and makes magic happen to this caliber. It’s true, the writing of George R. R. Martin is the foundation, but in order to make his story visual with the level of quality it deserves, it took the right combination of people to do it (even if they mess with the original storylines). Obviously by now I have read all of the books, and there are certain things that have been or will be cut out that I wish were to be kept in the show. However, there really is an abundance of characters and storylines. I understand why it’s not possible to include everything on the TV program. I hve a hard enough time trying to summarize it for someone who has never watched it! Tonight, GOT premieres it’s fifth season on HBO at 8pm and I will be watching it on the new streaming service that was recently launched, HBO Now. I decided since I will not be adding an additional expensive channel set to my cable plan, I’d try this online viewing method (the first month is a free trial, and the monthly subscription plan is $14.99–I’m not being sponsored to mention anything about it, I just wanted you all to know you can watch it free for a month)! You will have to subscribe through the iTunes App Store on a compatible device, or there is another service I have never heard of that is handling subscriptions as well. Once I downloaded the HBO Now app to my phone, I signed up for the service using the app. After that I signed in via my internet browser on my laptop so I can watch HBO programming on my computer. I signed into the website and watched a movie last night to test out the quality of viewing and content selection. I’m a bit worried about the fact that while I was watching Capturing Mary, the sound and picture glitched a bit now and then. It might have been my connection, it may be HBO Now’s server load or a streaming issue. I’m hoping it won’t continue to be an problem, but we’ll see. It didn’t affect things too badly. I am excited to finally be able to watch one of my favorite shows the same night the new season begins (unless the server crashes). 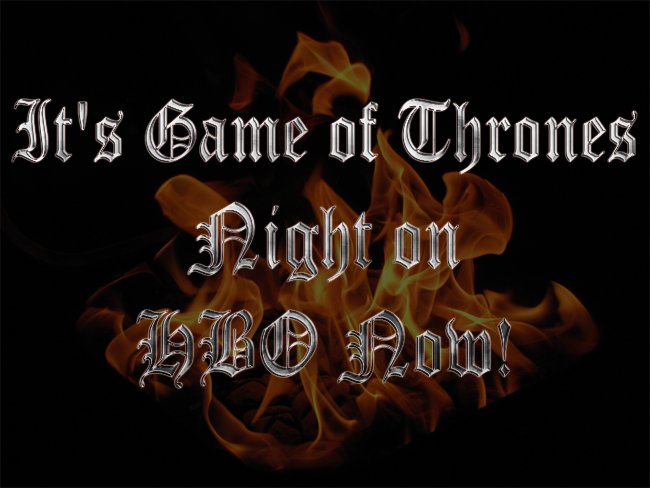 If you tune in tonight, enjoy the season’s first episode of Game of Thrones!